A letter from E. R. Trafford to Henry Shelton Sanford (1823-1891), dated February 10, 1883. The letter concerned the fate of one of Sanford's former employees, a Swedish immigrant who was arrested, presumably for theft, but never charged because of a lack of evidence. Trafford informed Sanford that the Swede had been advised to sue Sanford for some $3,000 in damages, adding that the ex-employee had indicated that he would be willing to drop the suit for a sum of $1,000. Trafford wrote that he had responded that it was a "case of black-mail" and that he thought that "we should put both him and his lawyers in jail." 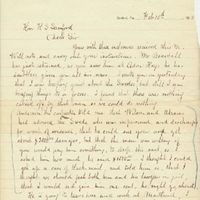 The letter demonstrates the role of Sanford's Florida agents and managers in maintaining affairs in Sanford's absence, as well as the conflicts between Sanford and the Swedish laborers. Trafford was a company agent for the Florida Land and Colonization Company (FLCC) from 1882 to 1886. The FLCC was a joint-stock venture that invested in Florida land development and sales in the 1880s and early 1890s. The company was formed by Henry Shelton Sanford with help from a group of British investors. The original impetus for the company's formation was Sanford's inability to continue his land acquisition and development efforts in Florida independently. Located at 13 Austin Friars, the company was officially registered in London on June 10, 1880. With the formation of the FLCC, all of Henry Sanford's Florida properties were transferred to the company in exchange for a £10,000 cash payment and another £50,000 in company stock. Sanford was named President and Chairman of the Board.In 1880, the company owned 26,000 acres scattered across Florida, including in the cities of Jacksonville, St. Augustine, and Sanford, as well as in Alachua County and Marion County. Original letter from E. R. Trafford to Henry Shelton Sanford, February 10, 1883: box 54, folder 18, subfolder 54.18.3, Henry Shelton Sanford Papers, General Henry S. Sanford Memorial Library, Sanford Museum, Sanford, Florida. Digital reproduction of original letter from E. R. Trafford to Henry Shelton Sanford, February 10, 1883.
blackmail; Florida Land and Colonization Company; immigrants; lawsuit; lawsuits; litigation; migrant labor; Sanford, Henry Shelton; Swedes; Swedish immigrants; Trafford, E. R.
Trafford, E. R.. “Letter from E. R. Trafford to Henry Shelton Sanford (February 10, 1883).” RICHES of Central Florida accessed April 23, 2019, https://richesmi.cah.ucf.edu/omeka/items/show/4303.